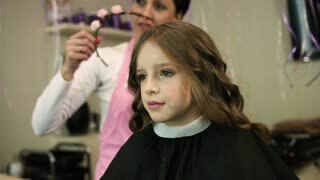 The Stylist is Making a Hairstyle in the Salon of a Girl. 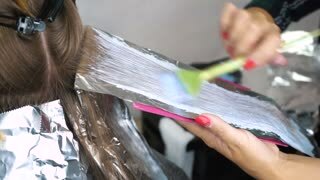 Professional hairdresser, stylist making curls on womans brunette hair with curling iron in beauty salon. Hair dresser working on a woman's hair. Shot on RED Epic. Close-up shot of a woman having her hair straightened. Shot in slow motion on RED Epic. An attractive young woman having her hair blow-dryed. Shot in slow motion on RED Epic. Attractive young woman having her hair styled by a hairdresser. Shot on RED Epic. 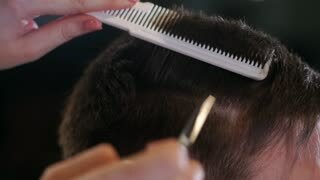 A male hair dresser cutting a client's hair. Shot on RED Epic in slow motion. Hair dresser combing customers hair. Shot on RED Epic. Hair dresser combing customers hair. Shot on RED Epic in slow motion.